Many folks serve lasagna on Christmas Eve. Prepared ahead, it’ll feed an army. Instead, I like to make a colorful pan of stuffed peppers, and keeping all those holiday treats and calories in mind, I make it vegetarian, served with a nice salad. Double them if you’re entertaining. Here’s your complete, mostly red and green, Christmas Eve (or any eve) supper from breakfast with Overnight Coffee Cake, an appetizer, salad, and entrée for dinner, and a classic Wassail that you can make ahead. cranberry orange cheese ball A lovely combination and a great way to start a meal. Chop cranberries in a blender or food processor. Add cream cheese, juice, and sugar, and blend till well mixed. Use a rubber scraper to turn mixture out onto a piece of wax paper and shape into a ball as best you can. Place in a bowl and wrap with the wax paper. Refrigerate overnight. Melt butter in a small saucepan on medium heat. add pecans and sugar and stir about 3-5 minutes. Do not let it burn! Spread on sheet of wax paper or parchment to cool. When ready to serve, remove cheese from ‘fridge and shape into a ball. Pat pecans on to cover. Serve with crackers, celery and carrot sticks, or pita chips. broccoli salad This is Trisha Yearwood’s recipe. It is very good, and the sunflower seeds are a nice touch. In a large bowl, mix mayo, sugar, vinegar, raisins, onions, and salt and pepper to taste. Add broccoli and pimentos to coat. Refrigerate 2-3 hours or overnight. Sprinkle with bacon and seeds just before serving. saucy stuffed peppers I make these with tempeh, a fermented soy product found in the vegetarian section of your store. Healthy, tasty, and very good for you, you won’t miss the meat. (Of course you can use ground meat if you wish.) You can make these ahead without placing in sauce, wrapping the stuffed peppers individually in clear wrap or a plastic bag. Blanch seeded pepper halves by boiling five minutes. Handle carefully with tongs. Shock in icewater. Drain well. Cover the bottom of a 9 x 13 Pyrex dish with sauce reserving ½ cup for filling. Nest all six pepper halves into sauce, cut side up. Set aside. 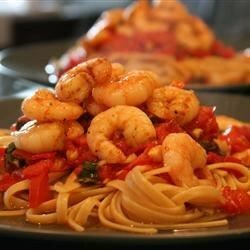 In a large skillet, place olive oil, and heat on medium till shimmering; add onions and garlic,, stirring often, for about four minutes till soft. Sprinkle with Italian seasoning. Add tempeh and press with a fork to improve the crumble texture. Add mushrooms and ½ cup reserved sauce, stirring to coat. Add bread crumbs, ¼ cup of the parmesan, and salt and pepper to taste. Cover and bring to a simmer for about 5 minutes. Remove from heat; stir well. Fill pepper halves with tempeh mixture, dividing evenly. 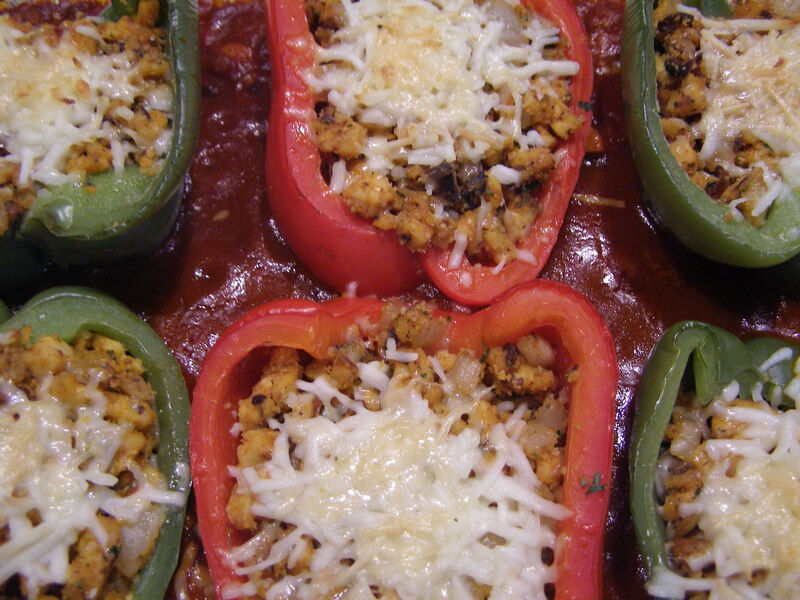 Cover with foil and bake 20-25 minutes or till sauce is bubbling and peppers are tender.. Mix mozzarella with remaining parmesan. Remove foil, sprinkle with cheese mixture; return to oven till cheese is melted and browning. Serve orzo pasta topped with a pepper half or two and a dollop of sauce. Variation: If you need to double the servings to six peppers (12 halves), you can increase the filling without needing more tempeh by adding 6-8 more mushrooms, a can of well-drained petite diced tomatoes, and a half bag of washed baby spinach. Increase oil to 3 Tbs and double the breadcrumbs and cheese. Cooked rice can also help stretch it. no-hassle wassail Serve this tasty hot drink when the carolers come home from a frosty night of song. Or just anytime you’re in the mood for a sweet, spiced treat. You can cut ingredients in half for a smaller crowd. The rum is optional, of course! Simmer until a heavenly aroma fills the kitchen. Transfer to a crockpot and keep warm while serving. For a fancier look, float orange slices decorated with cloves among the cinnamon sticks. overnight coffee cake Serve this to overnight guests or your family on Christmas morning. They’ll think you’re wonderful! Grease a 9×13 pan. Set aside. Place flour, white sugar, sour cream, butter, half of brown sugar, eggs, baking powder and soda, cinnamon, and vanilla in a large bowl. Beat at medium speed till blended. Spread in prepared pan. Combine remaining brown sugar, nuts, and nutmeg. Sprinkle evenly over batter. Cover and refrigerate overnight or up to 24 hours. Next morning, preheat oven to 350°. Remove cover from pan and bake 35-40 minutes until it tests done. Very aromatic, warm, and delicious. Holidays are the perfect time to share food and fun with family and friends. I hope yours are blessed. 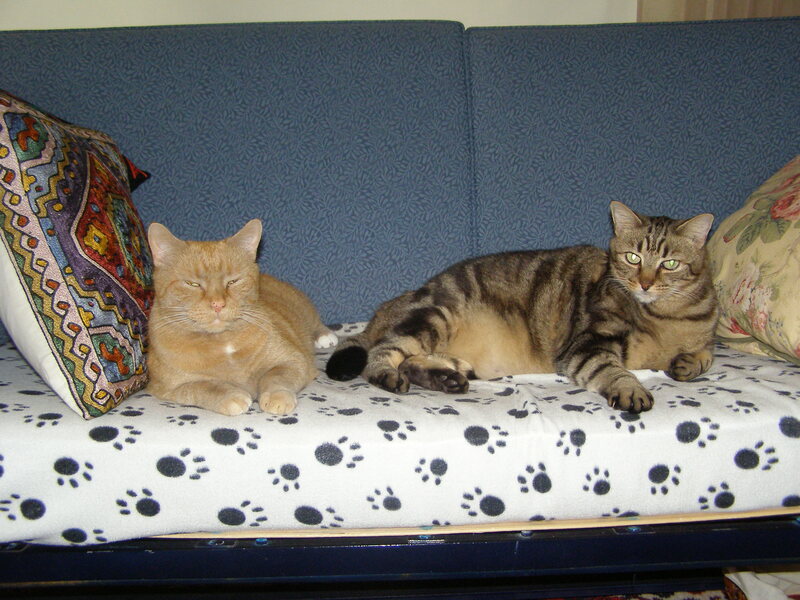 kitchen assistants taking a break. I usually start my serious holiday baking this week, especially since my feline kitchen assistants are eager to pick up some odd jobs like diving after anything that falls on the floor and licking the bowls, of course. Just kidding, but really, I need a solid two weeks to get all my sweets and savories planned and prepared.You can print these recipes using the PDF link at the end of this post. I won’t bore you with the typical chocolate chip and peanut butter cookie recipes. My treats are special, and will add a festive and delicious touch to your table. This week it’s cookies. golden cups So delicious, these tiny little pies will melt in your mouth. If you prefer, you can substitute chopped slivered almonds or pecans for the walnuts. On the day before (or within a week of baking, make dough), soften the cream cheese. Sift flour with ¼ tsp regular salt. Blend butter with cream cheese till streaks are gone; add flour. Shape dough into a ball, wrap in foil, and refrigerate. Beat eggs in medium bowl on medium speed, add sugar, melted butter, and pinch of salt. Stir in nuts and vanilla. Divide dough in 4 parts (each fourth will make 12 cups). Refrigerate all but one. Pinch off and form into 12 balls. Press each ball into ungreased 1 ¾-inch muffin tins, forming slightly rolled edges at top. Fill half full with nut mixture (about 1 heaping teaspoon). Bake 20 minutes till light golden and filling is set. Cool a minute or two before removing to wire rack. Cool pan between batches. Makes 48 cups. Recipe can be doubled or halved according to your needs. aunt olga’s christmas cookies In Philadelphia, our neighbor across the street would send a platter of cookies over to our house every Christmas. She was descended from the Pennsylvania Dutch. “Deutsch” (pronounced doitch) means “German,” and they are famous for their amazing food. 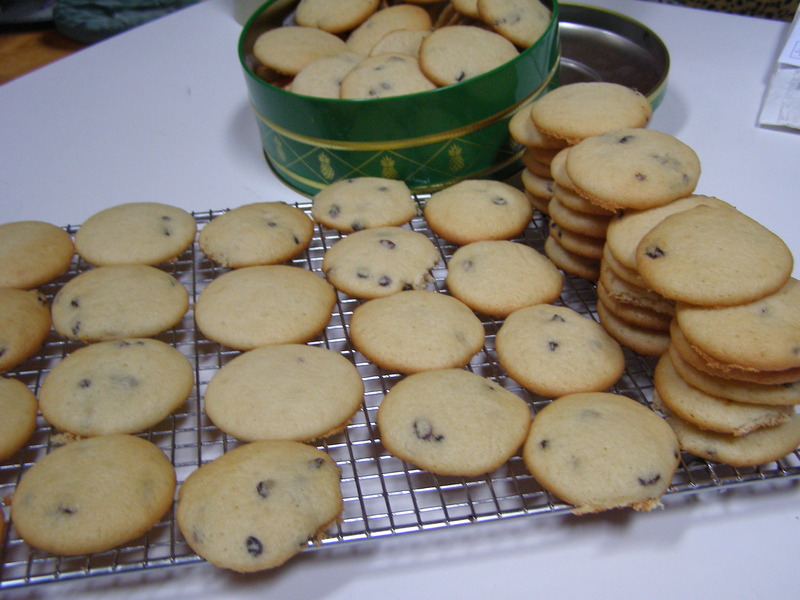 Anyway, these cookies don’t look like much, the ingredients are rather common, but they have that certain “umami,” an indescribable flavor that keeps you reaching for more. Follow directions to a tee for best results. Cream butter and sugar, add 2 of the eggs. Mix well. Stir soda and cream of tartar into the flour. Add to butter mixture. Dough will be stiff. Cover with wax paper and chill for at least an hour. Or overnight. Preheat oven to 350°. Pinch off dough and roll into small balls the size of a walnut. Arrange on an ungreased cookie sheet 3-4 inches apart. Once arranged, cover a flat-bottom tumbler or jar with a flat lid with wax paper, Secure with a rubber band. Use to flatten each cookie as flat as possible. 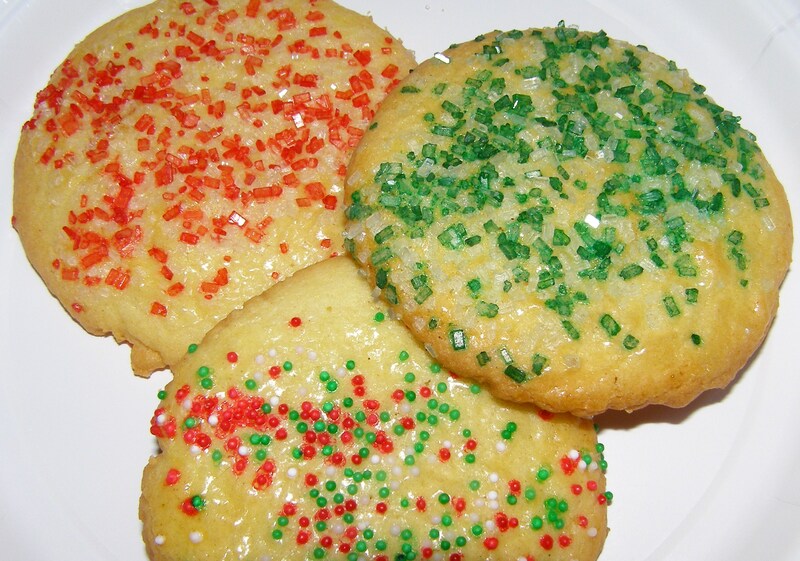 Brush tops with beaten whole egg and decorate with colored sugar, confetti nonpareils, or cinnamon and sugar. Bake 10 minutes till lightly golden and egg is set. Cool on wire racks. Store in tight-lidded cans or plastic bags. Crisp and amazing! marina’s wonder cookies I worked with a young woman who brought these into the office one Christmas. I had to have the recipe—they taste like expensive chocolate-covered toffee, but you won’t believe the simple ingredients and ease of making them. If you’re careful, you can break these up pretty evenly, but they will often break randomly. It’s okay. They taste so good, no one will complain! Preheat oven to 350°. Coat a large cookie sheet (with sides!) with cooking spray. Arrange saltines in a single layer to cover the bottom of the cookie sheet. Place butter and sugar in a saucepan. Bring to a full rolling boil over medium heat. Carefully pour boiling mixture over crackers to cover evenly. Place in oven for 10 minutes. Remove from oven to wire rack. When bubbling stops, sprinkle chips over top and spread with an offset spatula as they melt. Cool and refrigerate. old-fashioned no-bake cookies This the closest thing to fudge without all the work. I have a friend who folds in mini marshmallows at the end. That sounds good! Line a couple of cookie sheets with wax paper. Measure out oats in a bowl. In a large saucepan, place sugar, butter, milk, and cocoa. and bring to a boil over medium high heat, stirring constantly. Boil hard for 1 minute. Remove from heat and add vanilla, peanut butter, then the oats. Keep stirring and work quickly or mixture will begin to dry out. Drop by teaspoon onto wax paper or use a small cookie scoop. Keep them small so they dry evenly. Stack in containers in the ‘fridge between sheets of wax paper. no-bake apricot coconut candy cookies Make anytime up to one week ahead. Nice to tuck in among the regular cookies on your cookie plate or gift boxes. In a large bowl mix butter with syrup. Stir in water, vanilla, and dry milk and mix well. Add apricots and coconut and knead until thoroughly blended. Roll into 1-inch balls or use a small cookie scoop. Store in a loosely covered container at room temperature. TIP: If you can’t find bulk apricots, the Dollar Tree has very good, reasonably priced bags of dried apricots. ALSO, cookie scoops will make your life SO much easier. I don’t know how I ever lived without them before a couple of years ago! My first two, a 1-teaspoon and a 1-tablespoon size, were from Pampered Chef, a gift from my son, but they were pretty expensive. Here in Maine, we have a discount store, Marden’s, where I was SO fortunate to find meatball size scoop, same quality, for $4.00! Don’t you just love bargains??? connie’s currant cookies Currants are small, round, seedless dried berries related to gooseberries. I call these Connie’s because I had to come up with this recipe myself after losing the one given to me by a coworker many years ago. Her name was Michelle, but everyone call her “Mitch.” She was a big woman, built like a football player, but she was a kind and gentle soul who baked me a batch of her currant cookies the Christmas before my first son was born. These are great with a hot cup of tea and a good book! In a large mixing bowl, cream butter and sugar until very fluffy and light in color. Add eggs and vanilla and beat on high for two minutes. Sift together dry ingredients in a large bowl. Gradually add dry to wet, combining slowly, including ½ cup of the milk. If batter is too stiff, add remaining ¼ cup milk. Stir in currants and mix till distributed. Drop by rounded teaspoonfuls onto an ungreased cookie sheet. Bake 11 minutes. Remove to cooling rack. This makes 11 dozen. This blog is a week late—not because of me—because I have to wait 24 hours after it appears in the newspaper before I can post it, and the paper delayed publication for a week. Sorry, but I hope it is well worth waiting for these BONUS recipes. OMG! I’ve never met anyone who doesn’t like chocolate. And I’ve known a few who are addicted to it. Previously thought to be bad for you, scientists now believe it is a healthy addition to a good diet, providing valuable trace minerals. It has also been proven that the fat in chocolate (cocoa butter) doesn’t raise your LDL (bad) cholesterol. It raises your HDL (good) cholesterol. My mother was a chocolate addict, and I grew up enjoying the fruits of her obsession. I was a lucky girl. What a great combination of nutrition and deliciousness. So tear up the guilt-trip ticket. Hop on board the chocolate express! An amazing dark chocolate cake, this is unconventional in its method. I’ve never made a cake like this. But once I tried it, I was hooked. 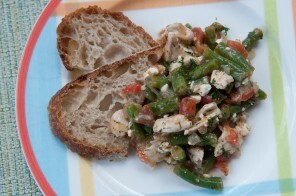 I found this recipe on JustAPinch.com and posted by Sheila Senghas. Your family will be begging you to make one of these every week! Preheat oven to 400° and grease a 9 x 13 baking pan. Melt butter in a 2 qt or larger saucepan. Add cocoa and water and bring to a boil. Remove from heat and stir in granulated sugar. Add salt, soda and flour, and stir well. Melt butter in a medium saucepan, add cocoa and milk, and bring to a boil. Remove from heat, add water, vanilla, and sifted confectioners sugar. Mix well. Frosting is not stiff. While cake is still hot and frosting is still warm, pour frosting over entire top of cake and spread evenly. Cool well before cutting. WOW! She knocked it out of the park with this one. You can, too! Absolutely simple, easy and delicious. They’ll think you’re a genius. Preheat oven to 350°. Melt butter and chocolate chips in a saucepan. Stir in milk, water, and eggs. Remove from heat and stir in remaining ingredients. Pour into pie shell and bake for 40-45 minutes till center is set. Chill 3 hours. Serve with ice cream, whipped cream or marshmallow fluff. Heaven! These are really chocolatey, so look out! My friend Matt Wilson’s daughter, Rachel, really loved these treats I made one Halloween, and he asked me for the recipe. Since he is an avid Red Sox fan and I root for the Yankees, we usually have lively trash-talking sessions around baseball season, so I sent the recipe card over and called these “Yankee Brownies.” Not nice, I know, but he can take a good ribbing! Preheat oven to 350° and butter a 9 x 9 square pan. Melt baking chocolate and butter over low heat in a saucepan. Cool 30 minutes. Mix eggs, sugar and syrup and beat in cooled chocolate mixture. Stir in flour and baking powder. Turn into pan and bake 25 minutes. DO NOT overbake. Remove from oven onto a cooling rack. Spread chocolate chips evenly over the top to melt. Cool very well before cutting into squares. This can be doubled and baked in a 9 x 13-inch sheet pan. Variation: Soak 1½ cups chopped walnuts in 1/3 cup bourbon for an hour before adding to batter. Yummy! Salty-sweet is the going trend. This bar does not disappoint. Preheat oven to 350° and grease very well a 9 x 13 glass baking dish. Cooking spray is fine. Combine flour, oats, sugar, butter, cinnamon, and baking soda in large mixing bowl. Press half the mixture into the bottom of the pan and bake for 10 minutes. Pour caramel into a medium bowl and stir in 6 Tbs of the flour. Pull baking dish from oven, sprinkle chocolate chips over the hot crust, then pour the caramel and flour mixture over the chips and spread with an offset spatula. Sprinkle the salt over the caramel topping. Crumble the remaining crust mix over the top and lightly press to set in, but do not press down. Cool completely and cut into bars. Add a bit more salt if you’d like.